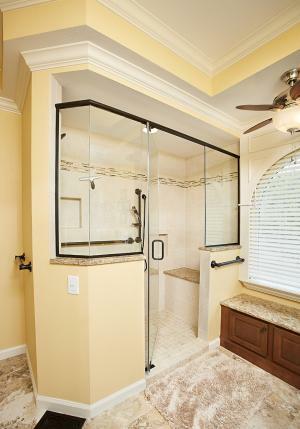 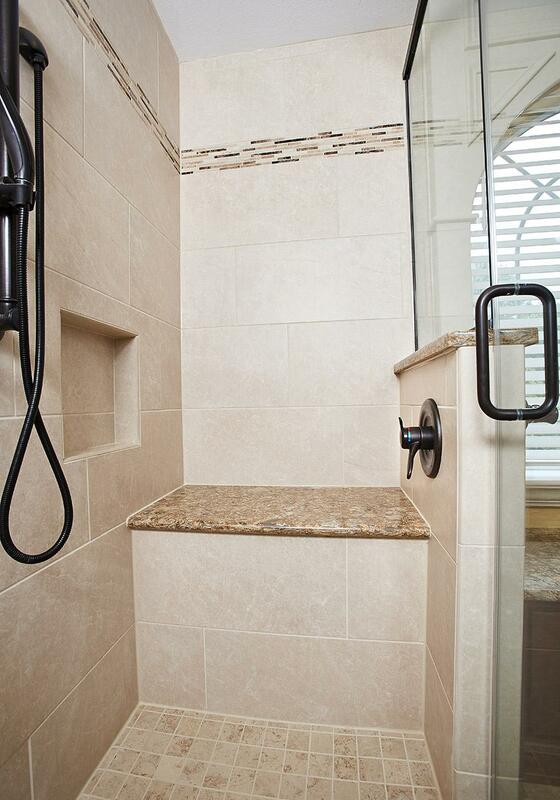 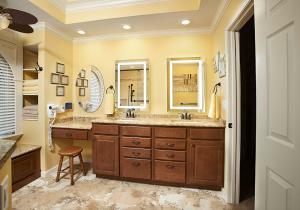 The Sauerbry’s decision to have Fulford Home Remodeling remodel their Master Bathroom was two-fold. First, the need to make the bathroom more “user friendly” due to physical disabilities entering in. 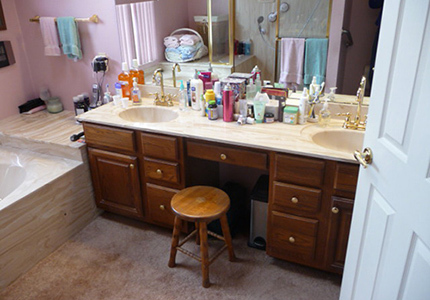 As well, it was time to get rid of the dated bathroom carpet, polished brass fixtures, low height vanity cabinets and cultured marble tub and shower. 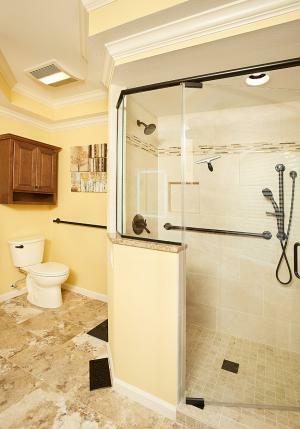 This client’s ideas and dreams were brought to life with an initial floorplan layout and 3-D design, which included an ADA friendly porcelain tiled shower with bench seat, two shower valves, hand-held shower system and multiple grab assist bars, a 17” high toilet with grab bars, Multi-level Birch vanity cabinetry with Quartz countertops and LED lighted mirrors. The existing ceiling was a sloped cathedral style, but the owner’s wanted a more interesting ceiling look, so a multi-tiered ceiling was created with accent crown moldings. 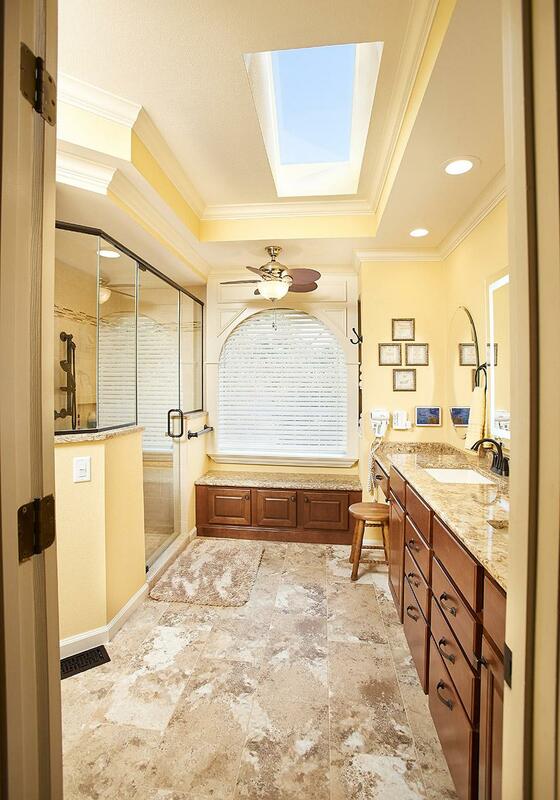 Other features included an open shelving niche, Alterna tile flooring, a bench window seat, a custom “heavy-glass” pivot shower door system, and an arched custom-built shadow-box around the existing arch-top window, which allowed us to conceal blinds behind it. 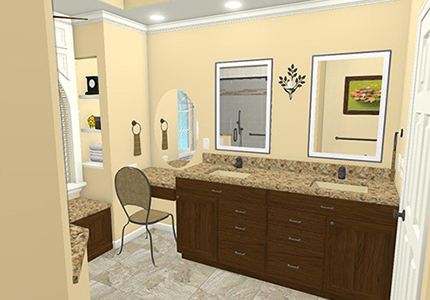 This stunning Master Suite renovation added both value and livability to the Sauerbry home resulting in a very happy client.